This is a simple and tasty noodle with shallot oil, anchovy broth, crispy shallot and soy sauce. It's great light meal, or you can top with any meat or vegetables for a more substantial meal. Anchovy Broth: Bring the mixture to a boil and simmer for 30 minutes. Remove the onion, and anchovies. Then season with sea salt. Crispy Fried Shallots & Oil: Fry shallots until light golden brown and crispy and drain well. Reserve the oil. To serve: Place a portion of egg noodles into a pot of boiling water. Cook for about 50 seconds, remove with a strainer and plunge into cold water. Shake-off excess water and return to the boiling water. Cook the noodles for another 10 to 15 seconds, but still al dente. Remove the noodles and shake off any excess water. Place shallot oil, light soy sauce, white pepper, and some anchovy broth in a bowl. Toss in the noodles and mix well. 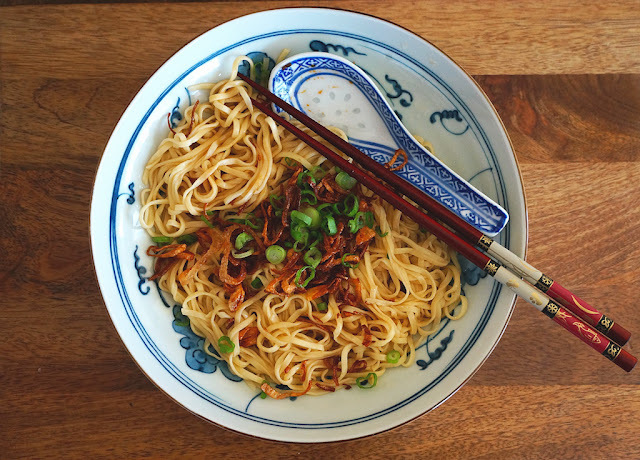 Transfer the noodles into a bowl or plate and top with crispy shallots and sprinkle some scallions.